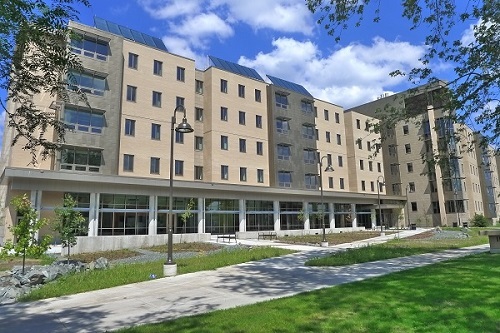 The Suites@201 Reserve residence hall is a Leadership in Energy and Environmental Design (LEED) Gold Certified building and uses solar panels to heat its hot water supply. October 22, 2014 /3BL Media/ - The University of Wisconsin-Stevens Point’s sustainability efforts have caught the attention of a national automaker. Chevrolet has chosen to partner with UW-Stevens Point and a handful of other institutions of higher education that undertake energy-efficiency and renewable-energy projects. As part of a voluntary carbon reduction initiative, it is buying and retiring carbon credits from colleges that have reduced greenhouse gas emissions to permanently benefit the environment. The credits will not be used to offset emissions related to specific Chevrolet operations or products at any site. The announcement comes on National Campus Sustainability Day. UW-Stevens Point is the only campus in Wisconsin selected. UW-Stevens Point was considered because its performance ranks among the top 15 percent of universities in the nation for energy conservation. Greenhouse gas emissions have declined at UW-Stevens Point since switching from coal to natural gas at the heating plant. Chevy looked at emissions of all on-campus fuel combustion, except vehicle fuels, for a period of time following a 2007-11 baseline. In fiscal year 2012, UW-Stevens Point consumed no coal. The Chevy carbon reduction project uses an average reduction over several years. It calculated UW-Stevens Point reduced emissions on average by 10 percent annually. The campus will receive an estimated $30,000 to $35,000 for its carbon credits, which will be reinvested in additional energy-savings projects. One possibility being considered is a wind turbine demonstration. A college’s energy efficiency performance must qualify as beyond-business-as-usual greenhouse gas reductions. If verified as voluntary carbon credits, Chevrolet, and potentially other entities in the future, would then pay campuses for these reductions and permanently retire them. UW-Stevens Point is among 675 campuses in the nation pledging to go carbon neutral. This funding from Chevrolet can help universities reach their goals. Chevrolet’s investment is part of a broader commitment to prevent up to 8 million metric tons of carbon dioxide from entering the air in a five-year period. For more information, visit www.uwsp.edu/sustainability. Follow the sustainability conversation on Twitter and tell Chevrolet about campus clean-energy efforts at #CleanEnergyU.